Is there still time to pay 2018 bonuses and deduct them on your 2018 return? | Steyer & Co.
Is there still time to pay 2018 bonuses and deduct them on your 2018 return? There aren’t too many things businesses can do after a year ends to reduce tax liability for that year. However, you might be able to pay employee bonuses for 2018 in 2019 and still deduct them on your 2018 tax return. 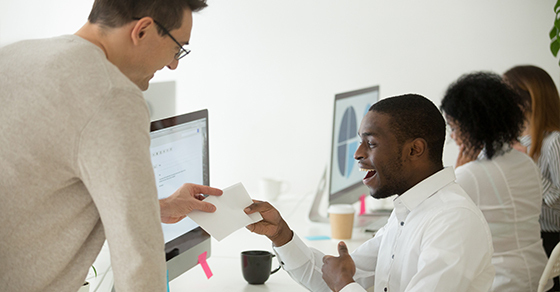 In certain circumstances, businesses can deduct bonuses employees have earned during a tax year if the bonuses are paid within 2½ months after the end of that year (by March 15 for a calendar-year company). First, only accrual-basis taxpayers can take advantage of the 2½ month rule. Cash-basis taxpayers must deduct bonuses in the year they’re paid, regardless of when they’re earned. Second, even for accrual-basis taxpayers, the 2½ month rule isn’t automatic. The bonuses can be deducted on the tax return for the year they’re earned only if the business’s bonus liability was fixed by the end of the year. Generally, the last requirement isn’t an issue; it’s satisfied when an employee performs the services required to earn a bonus. But the first two requirements can delay your tax deduction until the year of payment, depending on how your bonus plan is designed. For example, many bonus plans require an employee to still be an employee on the payment date to receive the bonus. Even when the amount of each employee’s bonus is fixed at the end of the tax year, if employees who leave the company before the payment date forfeit their bonuses, the all-events test isn’t satisfied until the payment date. Why? The business’s liability for bonuses isn’t fixed until then. Fortunately, it’s possible to accelerate deductions with a carefully designed bonus pool arrangement. According to the IRS, employers may deduct bonuses in the year they’re earned — even if there’s a risk of forfeiture — as long as any forfeited bonuses are reallocated among the remaining employees in the bonus pool rather than retained by the employer. Under such a plan, an employer satisfies the all-events test because the aggregate bonus amount is fixed at the end of the year. It doesn’t matter that amounts allocated to specific employees aren’t determined until the payment date. So does your current bonus plan allow you to take 2018 deductions for bonuses paid in early 2019? If you’re not sure, contact us. We can review your situation and determine when you can deduct your bonus payments. If you’re an accrual taxpayer but don’t qualify to accelerate your bonus deductions this time, we can help you design a bonus plan for 2019 that will allow you to accelerate deductions when you file your 2019 return next year.